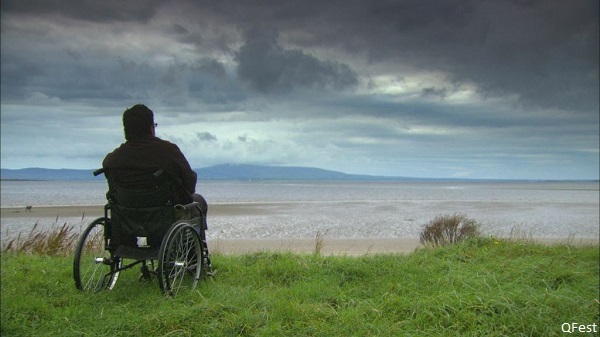 Robert Drake revisits Ireland for the first time since his attack. In January 1999, the unthinkable happened to Philly gay-lit writer Robert Drake. Having traveled to Sligo, Ireland, to research a novel, Drake was assaulted — in his own apartment — by two men he’d encountered earlier that night at a neighborhood bar. The men, who were sentenced to eight years in prison in connection with the crime, left Drake for dead in a pool of blood. Unable to speak for weeks as a result of brain-damaging acute head trauma, and beaten to the point of paralysis, Drake was thought to be the next Matthew Shepard — but unlike Shepard, Drake lived to tell his story. Feeling immensely inspired after reading an article about Drake’s story in the Irish Times in 2008, she acquired funding from the Irish Film Board to further pursue the story. The Ireland-based filmmaker soon after found herself at the doorstep of Drake’s Philadelphia apartment, pressing his doorbell with shaking nerves. She knew this would be her only shot at making the documentary film she’d been envisioning. Drynan says she used 100,000 euros worth of funds from the Film Board as well as a chunk of her own money to produce the documentary, which was shot in 2010 and 2011 in both Philadelphia and Ireland. The film, titled Where I Am, is a portal into the present-day life of Drake — a glimpse of how he’s coped with the assault more than a decade later. The 69-minute film follows his footsteps through the locales of Ireland where he lived his life leading up to the attack. Though the documentary has already premiered in Europe, Where I Am‘s July 12 screening at QFest will be its U.S. debut. Those interested in speaking one-on-one with Drynan and Drake can attend the post-screening reception, to be held at Knock from 9-11 p.m. following the premiere. Fri., June 12, 7:15 p.m., $11, Ritz East Theater 1, 125 S. Second St.